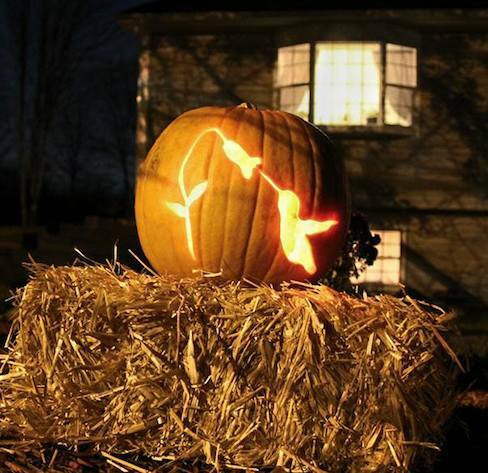 After Halloween (like tomorrow) you can take that pumpkin and recycle it for birds! Over at Hummingbirds Anonymous (a really cool facebook group with 26,000 members) this image appeared in their news feed. 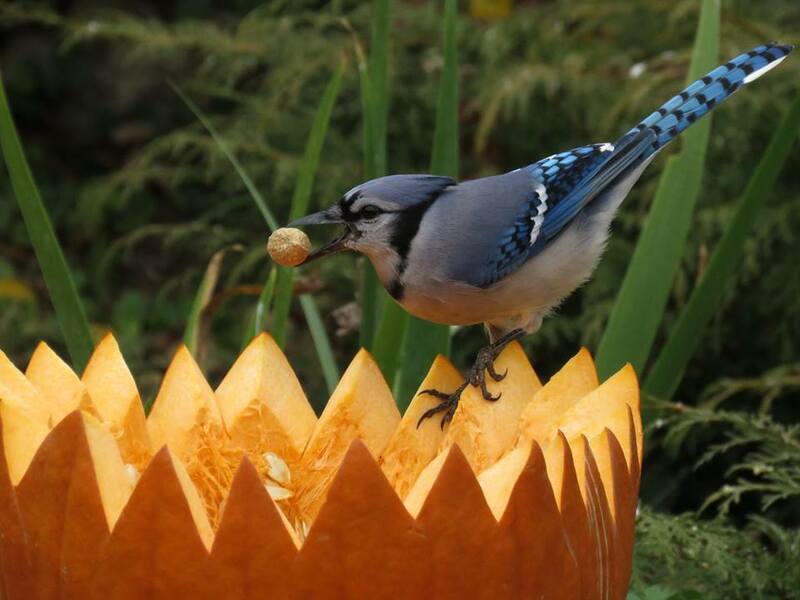 By digging a well, or scooping out the pumpkin, a hopper’s created to hold peanuts or seed for feathered friends. 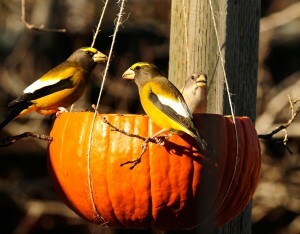 Another idea found over at Audubon.org, shows a hanging pumpkin with easy instructions for crafting this temporary hopper bird feeder. Some of the comments are fairly funny, bear feeder, squirrel feeder and raccoon attraction, so if planning on hanging a pumpkin for the birds, use a baffle on the pole to thwart squirrels and raccoons! Need an idea for a cool carving? 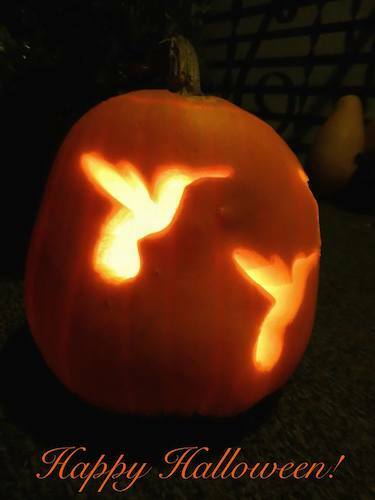 Back again at Hummingbirds Anonymous, these pumpkins rock with their bird themes! 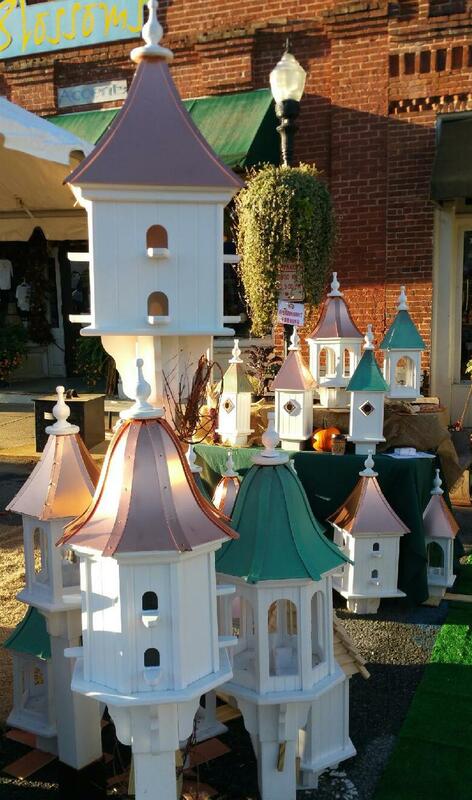 Folks do love their avian amigos and the ways are simple and many to help them thrive. The basics are easy, as in food, water and shelter. When planting, think native for natural food sources and shelter. Water need not be in a bird bath per se, just a shallow pool about 2 inches deep works great. This cold be a plant saucer or bowl from the kitchen! Add a few stones or a large rock to assist with safe footing for perching and landing spots. Depth is important, no more than two inches of water in any kind of vessel. Leave birdhouses up through winter as many species may use them to roost at night. 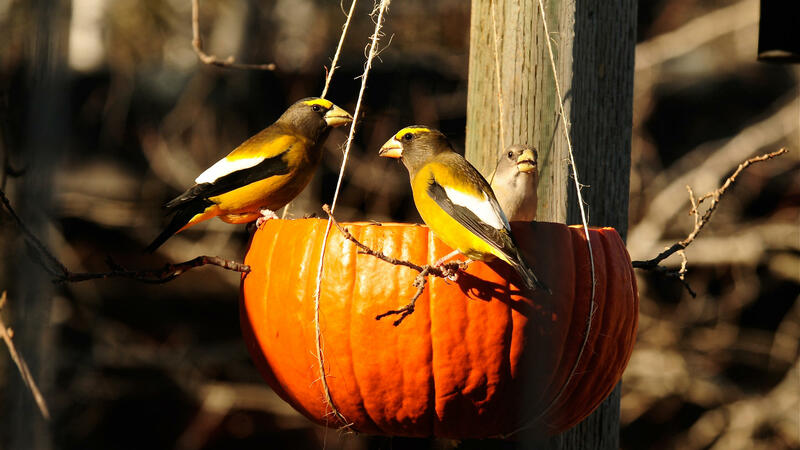 At holidays, be cautious of outdoor decorations as some may pose a real threat to wild birds. Just because migration is winding down doesn’t mean the cool birds are gone. Resident birds like chickadees, jays, nuthatches, cardinals and titmice will bring song and color to the garden through the dreary months of winter ahead. Happy Halloween to all ~ may it be a safe and fun one! When it comes to a tube bird feeder, they needn’t be straight or boring, some have spirals instead of perches while some may offer “all-over” feeding space. The amount of bird traffic in your yard may help decipher best size and style, and of course aesthetics! For optimal bird attraction and the widest variety of species, you can’t miss with black oil sunflower seed. We like using the hearts or meats as they leave less ground mess below feeders. More birds are likely to chow down as there’s no hull to crack, there’s literally no waste with this pure seed. The Wave Tube Feeder is a groovy variation of the boring straight tube style. It’s available for both black oil sunflower and thistle (or nyjer seed). Handcrafted in the USA, its cedar construction makes it durable for years of use. Thistle seed, also known as nyjer or nyger, attracts goldfinches, house and purple finches, red polls, buntings and other finch-family birds. It won’t make make too much of a mess either as it’s a non-germinating seed. Hulls may accumulate, but they’re tiny and won’t sprout weeds. It’s also a great offering to attract even more friendly fliers to your place. 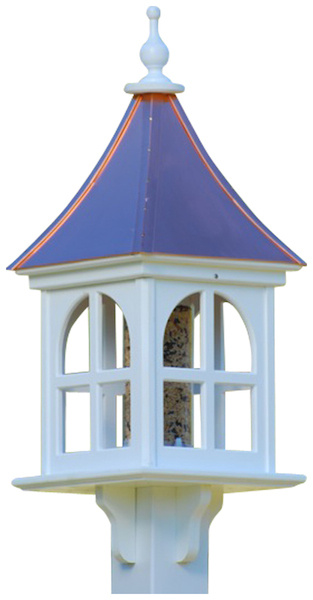 These mushroom top ceramic tube feeders are equally groovy, adding a whimsical splash of color to the landscape. Many a songbird would be happy to perch here for a meal on cold winter days! Cold? 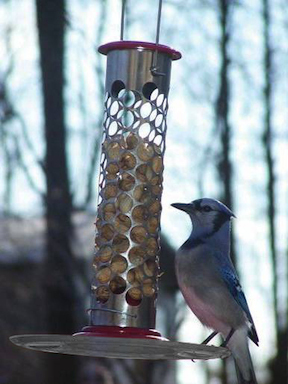 Yes, these feeders are frost-proof via process of twice-firing. They’re safe outdoors year-round, also handcrafted in the USA. The colors run the rainbow from cherry bomb to funtasmic blue… and everything in between! Protect your feeders from thieving destructive squirrels with a baffle, it’s only thing that really works to deter the critters. Birds dine in peace and hosts have less head aches. 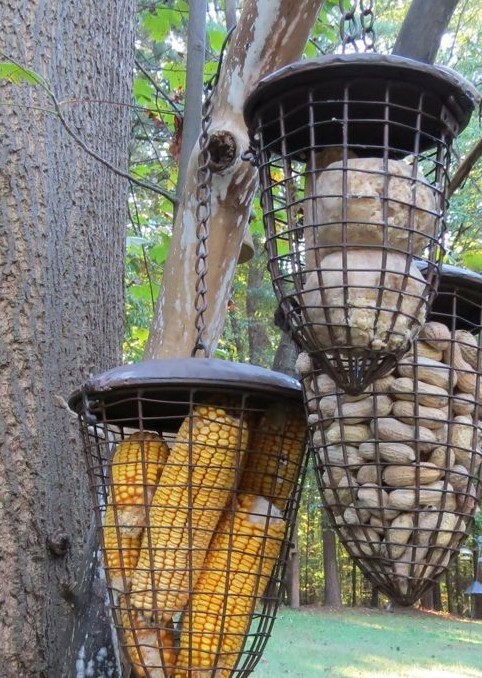 Place feeders so that squirrels can’t gain access by jumping sideways from something too. Feeder placement is always key in winning this war! 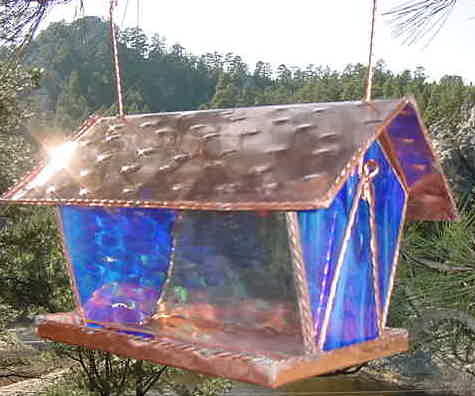 More so than any type of feeder or birdhouse, fresh water entices more birds everyday throughout the year. Even in frigid weather, they’ll flock to a functional bath. Adding a heater to your existing birdbath (instead of turning it over for winter) will bring birds on the greyest, coldest days of winter… brightening your day too! Lots of birds (and squirrels) adore whole peanuts, especially in colder weather- they pack a punch for higher nutritional value than seed alone. If you’d rather keep squirrels out of peanut bird feeders a baffle is highly recommended! Ideal for feeding whole peanuts, this wire basket set is versatile for lots of other goodies too. Use these for suet, corn cobs, nesting materials in spring, and even fruit in summer for migratory birds. 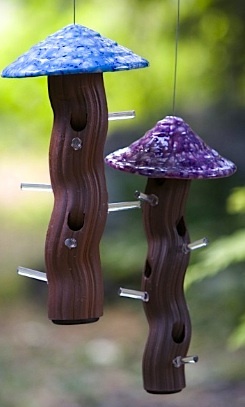 Use all 3 for peanuts and hang them in different spots around the yard to entice more feathered friends! They feature a long hanging chain with big hook for easy placement (plus enough chain length to accommodate a baffle). The locking lid will keep thieving paws out, and the solid roof helps protect goods from the elements. There’s also a tube style stainless steel version for whole peanuts which offers an optional seed tray. Inviting more than clinging birds, jays and other can perch in comfort on the 10-inch tray while it helps to catch waste. It’s actually dubbed as a suet ball feeder, but the large openings are perfect for whole peanuts. So you can really offer a variety of treats in one feeder, mixing some suet chunks or balls between peanuts to delight many a species! Clingers like chickadees, nuthatches, titmice and woodpeckers love this stuff, as well as jays, bluebirds and cardinals (in winter), phoebes, warblers… and the list goes on! Branch out from traditional feeders filled with boring birdseed and see who comes to visit? And as always, fresh water is key to bringing more birds to the garden. Even during frigid weather, songbirds will absolutely flock to a heated birdbath.